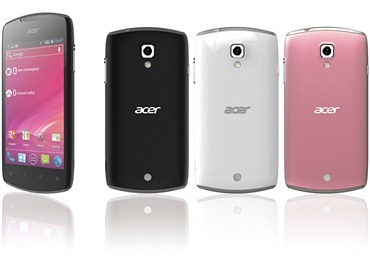 Acer just revealed their newest budget smartphone, and unfortunately details are pretty light at the moment. What they have told us: it's going to ship with Android 4.0 (Ice Cream Sandwich), a 3.7" screen, 5MP rear shooter with LED flash, and NFC support. As you can see below, it will also ship in 3 colors: Sakura Pink, Alpine White, and Cat's-eye Black. Oh, and "the onscreen display style varies with the external color, making each smartphone a unique fashion statement." No word on further hardware specs or when/where the phone will launch, but the phone will be displayed at the Acer Pod in the Google Android Booth at MWC - presumably they'll be sharing more details there.